The European Intercultural Festival, journalism ethics programme, national symbols campaign were just some of the civil society events which took place in Belarus over the last few weeks. This year for the first time the initiative "Save Kurapaty" together with the municipal service gathered to clean together the area near the Kurapaty forest, the place of execution and burial of the victims of Stalinist repression. European Intercultural Festival 2013. On 20-26 May, the first European Intercultural Festival is taking place in Minsk, Homel and Hrodna. The Festival agenda aims to promote knowledge about the EU and the EaP countries and includes language classes, discussion clubs, a presentation of European Volunteer Service, European Movie Night, presentation «An Illustrated History «This country called Belarus», BISS panel on facilitation of visa regime, etc. The Festival is a joint project by Belarusian and international organisations, including ODB (Brussels), OEEC (Minsk), BISS (Vilnius), Youth Centre Fialta (Minsk), etc. 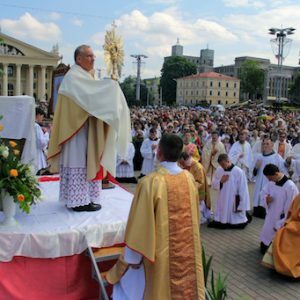 The Corpus Christi procession in Minsk on 26 May was attended by the highest number of participants – 10-12 thousand. This year procession, which attracted twice as many participants as last year, has become the most massive in the history of this march in Belarus; that may indicate the development of the Catholic faith in Minsk. National symbols campaign. On 14 May, a campaign on popularisation of Belarusian national symbols launched. The start of the campaign marks the day in 1995, when a national flag of three stripes – white-red-white – as well as a state seal (Pahonia) were changed on the current official symbols. The campaign organisers – Art Siadziba, initiative "Rock and Solidarity" and BMAgroup – started their activity with distributing the Belarusian music CDs and themed badges on the Minsk streets. Mediakritika is launching a new project. In its new video project portal Mediakritika.by will look for answers on actual media market questions – why the media cannot be divided into "we" and "they"; what quality journalism is, and who needs it; whether it is possible to keep a balance between media as a business and media as a profession. The participants of the project are Belarusian journalists, editors, bloggers, and representatives of profile CSOs. Kalinouski competition. On 22 May the organising committee to celebrate the Year of Kastus Kalinouski launched a competition on the rebellion of 1863-1864 and the personality of the national hero Kalinouski. The competition "Who knows better Kalinouski rebellion" is held in two phases – an online quiz and a "live" final in a format of brain-ring. Budzma presents a new concept. The campaign "Budzma" presents a new concept "Culture Improves Life" which will be revealed via a series of movies in which well known, successful Belarusians characters tell the story how the culture has changed their lives and made them real trendsetters in the media and public life. The next step is to promote the real content of the notion "culture" through a large series of interviews with prominent Belarusians. Roundtable Ad.nak! Minsk hosted a round table "How to Make Sports Clubs National Brand?" under in the 4th Festival of Belarusian-language advertising and communication AD.NAK! The discussion was attended by representatives of business and sports marketing, in particular, the director of sports marketing agency Sportteam, Head of Press Service of HC "Dynamo-Minsk", BATE marketing manager as well as Alyaksandr Kul, the initiator to name the basketball team as "Tsmoki-Minsk". Vouchers for CSO capacity development. Capacity Development Marketplace has shared information on approving and issuing vouchers which allows CSOs to get funding for a need-driven capacity development service. To the moment, the Marketplace has issued six vouchers which went to Office for the Rights of People with Disabilities, Brest and Vitebsk branches of YMCA, St Mikalai Christian Volunteer Movement, regional Agency Dzedzich. All awarded CSOs should have posted a tender at the Marketplace website and collected at least three bids from providers in order a deal was declared valid. Europe Day Education Fair. EU Delegation to Belarus and the EU embassies invite students, teachers and researches to Europe Day Education Fair. On 21 May, a number of foreign and local speakers will present the EU educational opportunities – TEMPUS program office in Belarus, Polish and Lithuanian universities and foundations of academic exchanges, the EU embassies, the Bureau of the German service of academic exchange (DAAD), Goethe Institute, the European Voluntary Service, etc. The event is to start at 10 am, at the Minsk IBB Centre. Visit on energy topic. The Brussels-based Office for a Democratic Office invites Belarusian experts to an educational visit on energy topic. The visit will take place in June 2013, in Brussels. The event is a part of Clearing House project and aims at deepening the contacts and the exchange of best practices between Belarusian specialists and their EU and EaP counterparts. The organiser covers all trip expenses. Belarusian Human Rights School announces a competition for participation in the Summer School on Human Rights in 2013. Under the program, participants will learn about the history and philosophy of human rights, as well as methods and tools of their protection at the national and international levels. Young people of 18-25 years from Belarus are invited to participate. The School is to take place at the Belarusian Human Rights House in Vilnius. Human rights weekend. On 18-19 May, Gomel and Mogilev hosted educational workshop "Human Rights on fingers". Everyone is invited to participate; for those who successfully pass the seminar the organizers provide in-depth human rights education, training and participation in the activities of the human rights and youth organisations. "Human Rights on fingers" is a regular educational workshop, held with the support of the Belarusian Helsinki Committee, Studentskaya Rada, the Human Rights Center Viasna, and Legal Transformation Center (Lawtrend). ARCHE re-registered. On 24 May the edition received the documents for re-registration. Valery Bulhakau will be editor in chief again. ARCHE did not publish from June 2012 due to problems with registration, now the editors plan a next issue for early summer. This year, the magazine celebrates its 15th anniversary. Talaka in Kurapaty. From 25 May to 3 June volunteers will conduct national "talaka" to clear the garbage in the area of Kurapaty​​, the place of execution and burial of the victims of stalinist repression. The works will be held in conjunction with the municipal service "Zelenstroyi", however, attempts of initiative "Save Kurapaty" to agree for assistance with the administration of the Minsk city administration have still failed. Belarus Digest and the Centre for Transition Studies are launching a series of analytical papers offering in-depth analysis of various aspects of Belarus often overlooked by Western experts and press. The forthcoming papers will deal with personalities within the Belarusian regime, national identity of Belarusians, the system of education in Belarus, reforms of bureaucracy, business climate and other topics. The first paper prepared by Siarhei Bohdan analyses the Belarusian political and economic establishment, its features and potential and prospects for change. While the government’s authority is concentrated in President Lukashenka, he needs a sophisticated state structures to run the country and has retained his retinue for years. While Lukashenka as a politician has been analysed quite extensively, his close comrades have scarcely been studied. The paper annex contains personal portraits of key figures in the Belarusian regime, including Lukashenka's older son Viktar, Prime Minister Mikhail Myasnikovich and Foreign Minister Uladzimir Makey. Belarusian ruling elites emerged as a result of an effective power-sharing deal between Soviet-era bureaucrats and new supporters of the Belarusian president who have risen from the depths of the provinces to the very top due to their talent and unscrupulous ambitions. This liaison has proven successful both in terms of its cohesion and performance.There has been just one failed mutiny, occurring in the late 1990s amongst the nomenclature, while the consolidated regime-linked elites have run Belarus rather successfully in terms of its governance and economy. Politically, Belarusian ruling elites of whatever origin have opted for an original path of development which has contradicted Western ideas about democracy and human rights, However, the opportunistic opposition to the West is not based on any profound ideology. The ruling establishment in Belarus can act as responsible and reasonable partner for the West if offered a pragmatic deal. While pragmatically working with the ruling elites for the sake of preserving Belarusian independence and working towards an eventual smooth transformation, the West should simultaneously demonstrate to the Belarusian people realistic prospects of cooperation with Europe at the same time placing firm demands on the government. 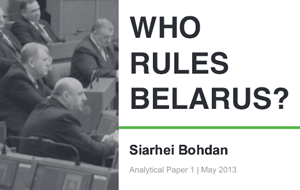 Read Analytical Paper "Who Rules Belarus"